I have received quite a few requests regarding where to locate beads and crystals for my designs. Due to the difficulty in sourcing the beads and crystals, and recognizing that most stitching stores do not have a large bead/crystal inventory, I have decided to assemble and make the following bead packs available. 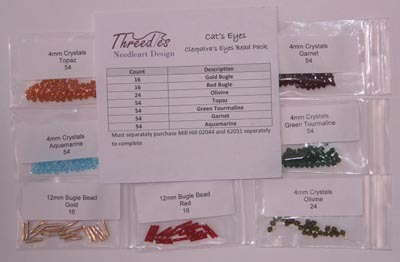 If you are interested in selling my bead packs please click here to send me an inquiry email Contact Threedles. Please indicate if you are a store or an individual and which bead packs you are interested in. Note since most stores carry common beads (e.g Mill Hill) my bead packs do not include common beads; the bead packs focus on the crystals and bugle beads since they are more difficult to source and a relatively small number is needed per pattern.